China was a huge naval presence in the early part of the 15th century. They arguably controlled the strongest military fleet in the world. Yet, by the time the Europeans came knocking on China's door, their maritime power was a shadow of its former glory. This page will highlight the success of China and what caused their maritime downfall. He is commonly considered to be the greatest Chinese admiral of the era, and perhaps even of all time. He was a Chinese born Muslim who was castrated and taken to the Imperial court at a young age. He quickly showed a divinity for naval activities and the natural marks of a capable leader. During his lifetime, he led 7 voyages throught the Indian Ocean. His fleet may have numbered as many as 317 ships, with each ship supporting 500 men. This is one of the largest fleets ever assembled and easily showed Chinese superiority and dominance wherever it landed. The routes that the admiral took were well known to the Chinese. They had been sailing those waters for hundreds of years so it would be incorrect to label Admiral He as an explorer. He was more along the lines of a good will ambassador on behalf of the Chinese Emperor. This map shows the route of the greatest Chinese admiral's 7th and final voyage. This voyage also marked the end of the era of China's naval dominance. The junk was and still is a common Chinese sailing vessel. They were capable of efficiently sailing long distances and were known for their advanced technologies. Indeed, many western ship designs copied ideas from the junk, such as hull design and sail designs. The junks that were in common use by the Chinese Navy were huge structures capable of fully sustaining a crew of 500 men. The largest junks which were used for world exploration, may have been as much as 390 ft long. The Qing came into power in China in 1644. They were the undeniable downfall of the once mighty Chinese navy. While the Ming never gained the same notoriety after zheng he died, they still kept their navy afloat and even defeated the Portuguese in the Second Battle of Tamao (1522). However, the practices of the Qing brought about the decline after this period of stagnation. 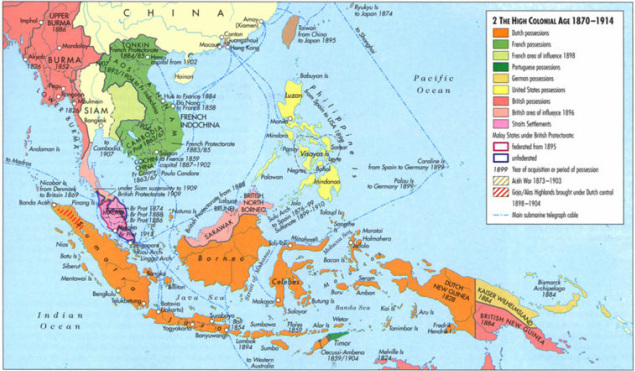 The Qing developed a policy that didn't allow its citizens from living by the waters of the Pacific Ocean. This alone shows how little importance they placed on maritime activities. Furthermore, the Qing Dynasty placed an emphasis on land armies, such as their green armies and Three Banner Army. This, coupled with the fact that the Qing generally neglected to use gunpowder, sealed the deal for the end of the Chinese navy's record of dominance. They could no longer compete on open seas with the newer, more heavily armed, European ships. This opened the door for Europe to colonize the entire region and to become the driving force behind the world's economy.